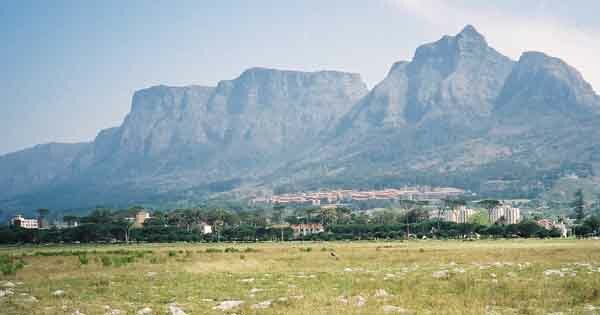 Back in 1657 in the times of Jan van Riebeeck the first families to be given land in the Cape Area were given land along the Liesbeeck River in Rondebosch area. These free citizens of Cape Town were called the Free Burghers and their contract with the Dutch East India company was to supply food to the company in Cape Town. All food produced was bought at a fixed price by the Company. Since then Rondebosch has grown quite considerably. Today it is a student town with the University of Cape Town situated on the hillside on the lower slopes of Devils Peak. Where there are students there is normally a thriving metropolis and Rondebosch is no exception.. During semesters the students fill the streets as they make their way to and from classes. UCT is well known for its medical faculty and worked closely with Professor Chris Barnard the first heart transplant pioneer. Professor Chris Barnard having completed his medical training at UCT in 1946. Another place of interest is the Rhodes Memorial which is also situated on the hillside to the north of the University. This memorial is in honour of Cecil John Rhodes who came to South Africa in 1870 to join his brother on a cotton farm. In 1871 he moved to Kimberley where he speculatively began digging for diamonds. In 1880 he founded the De Beers Consolidated Mines and later the Consolidated Gold Fields of South Africa operating from the Witwatersrand. The rest is history! He became the Prime Minister of the Cape in 1890 and remained in his post until his resignation in 1896. His memorial is built on the site where he used to place a bench to look out over Table bay to the north, False bay to the south and the Hottentots Holland Mountains to the east. Its a huge monument built of granite with steps leading down to a rostrum where one can look out over Cape Town. 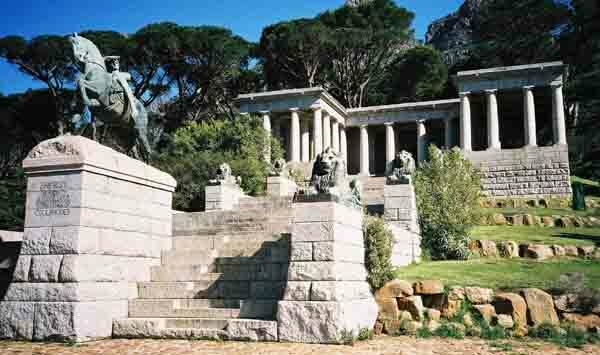 The stairs are lined by granite block walls which have statues of lions lying on them looking out over the Cape. In the centre of the staircase is a statue of a man on a horse looking east. Another place of interest is the Mostert's Mill . 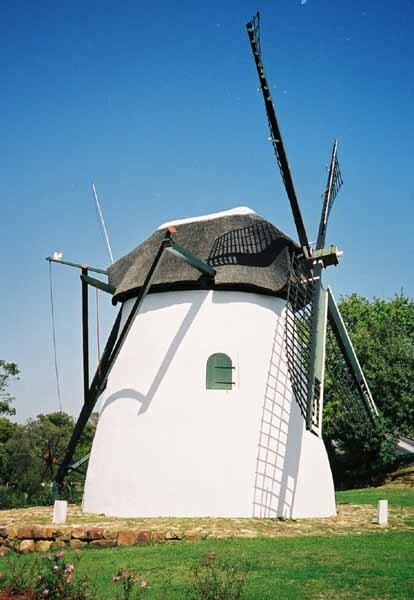 This mill was built on the farm Welgelegen in 1796 a year after the Dutch lost control of the Cape to the British. In 1823 the mill and the farm came in to the possession of one S J Mostert and the mill received its name from him. The mill has been restored a number of times over the centuries, the most recent being in 1995. Today the mill is operated by the Friends of the Mostert Mill who still mill wheat on Saturdays when they are open for tourists. What is very interesting are the sails of the mill which when not in use are parked facing the mountain. This keeps them out of the wind that howls around Cape Town in the summer. 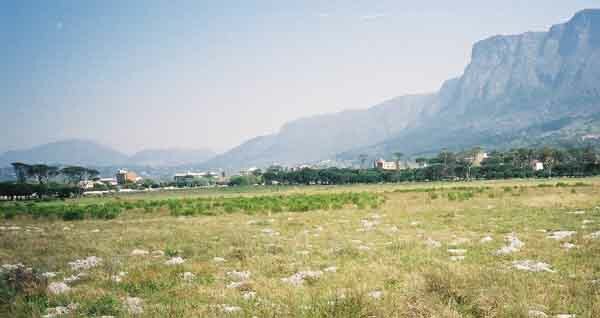 Another place of interest is the Rondebosch Common, which was first utilised by the Dutch as a military encampment. Maps dating back to 1807 show evidence of the military encampment on the common. In 1855 the rector of St Paul's church was given permission to graze his cows on the land . There was however a stipulation that the land was to remain open for public use. Over the years bits and pieces of the original common have been lopped off and put to various uses. One of them being the building of the Red Cross Children's hospital. A number of cemetries were also established and surrounded by pine trees but today there is no trace of the cemetries but the pines are still there. In 1961 the Common was proclaimed a National Monument and remains so till this day. On this 100 acre piece of open ground are 200 indigenous plant species ranging from buttercups, arum lilies, gazanias and irises to name but a few. There are also over 20 species of alien plants endangering the indigenous plants on the Common. The Rondebosch Common is a piece of prime land in the middle of the city which has escaped squatters and any attempts to build on it. The locals love this piece of open land and you can see them walking their dogs, jogging and doing their exercises there daily. May it stay that way for a long long time.